By the time you get the Gatte (gramflour dumplings) , the rice would be cooked, so its a matter of assembling it further. Ghee for this pulao gives a very aromatic flavour, but if you are vegan or don’t eat ghee, you can skip it. Let’s get to the recipe then. While you are making the gate, Wash and soak the rice. Rinse throughly and drain. In a pressure cooker / open pan, add ghee, whole spices. Saute onions if using, add rice and saute for 2-3 mins on low flame so that the rice gets really aromatic. Add the other spices- turmeric, garam masala, deGi mirch and saute further. Add salt, required water and cook rice till 70% done. Fluff up the rice once done and keep aside. In another thick pan, add oil , the cooked rice and gatte, sprinkle little water, cover and cook for 6~7 mins till fully done but not mushy. garnish with coriander leaves and serve with any gravy or just boondi raita. Wow, Kalyani! You are on to thaalis now. Somehow thaali theme is too intimdating and taxing one for me. The crunchy, crispy gattes really make this pulao a special one. Love your choice. Love the gatte ka pulao so much, my neighbor used to give me this dish. Your dish looks too good, love the crunchy gatte in the pulao. Really a yummy idea to prepare a pulao with leftovers.. 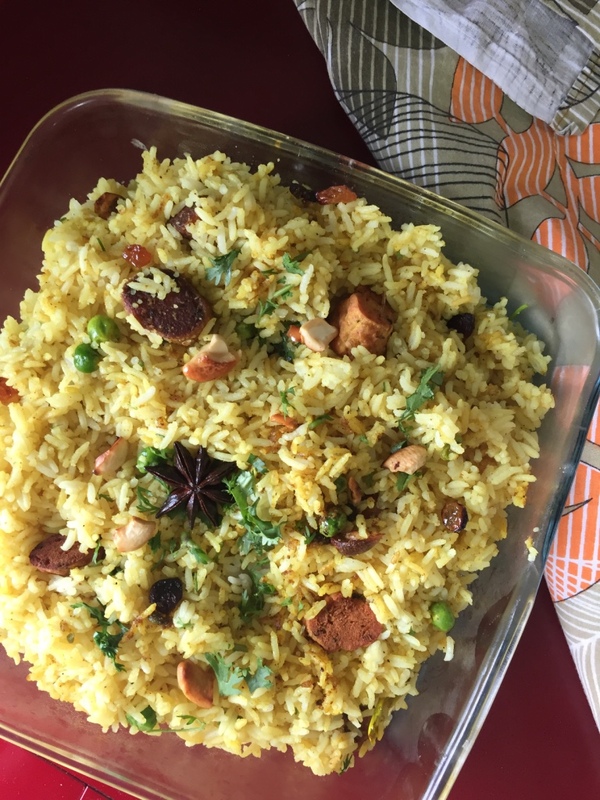 It really saves time and gives a delicious outcome..
What a flavorful pulao this is, right? Good pick and looking forward to the thali pic. This biryani looks wonderful Kalyani. And I surely know what you are talking about. So eagerly waiting for the thali. Already you are on thalis kya, man you are awesome. Between this gatte ki pulao sounds very interesting. I should try it out soon. You are one smart lady ! Working on different posts at one go :)) . 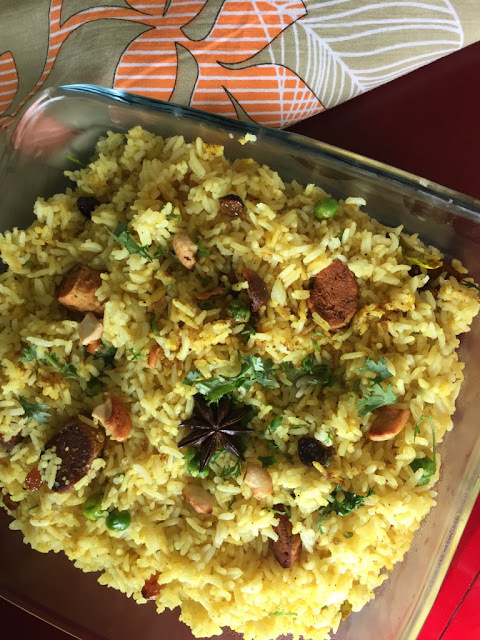 Gate ka pulao is a typical Rajasthani pulao , and my Rajasthani friends make it beautifully , but here I see a South Indian making it perfectly ! Awesome Kalyani . Excellent one Kalyani, and its really nice to know you are preparing way ahead!. Looking forward to those you know! I had this planned for G as well but had to drop it in the last minute. Your dish has turned out so well. Looks fabulous. and love that you are planning so far ahead. Kudos to you!